Hidden in plain sight, your cane is a potential weapon that you can bring anywhere. You can carry it through security checkpoints where other EDC gear (guns, knives etc.) can’t go. But what I like most about self defense canes is the element of surprise. Your attackers will see your cane as a sign of weakness or disability. They won’t see it coming. With proper instruction, you can learn to do sweeps, takedowns and joint locks. That’s advanced stuff, but your attacker won’t stand a chance. You can also use the cane to hook your attacker’s limbs and take away his mobility. You can crush his foot with the tip of your cane in close quarters. Finally, a strong cane blow to a vital area – head, neck, kidneys, knees – will end the fight real fast. A good self defense cane can be a lifesaver in situations where you don’t have access to other weapons (like your gun and your blade). Search Youtube for train station stabbings from China to London. If caught in one – wouldn’t you prefer a combat cane over a rolled up newspaper? And if you already use a cane… investing some money in a proper one is a no-brainer. Your cane is a part of you. It’s something you use every day. So why not get the best one available? Or maybe a sword cane? Keep on reading… or jump straight to the best self defense canes. An electric cane is a good choice if you haven’t started you cane self defense training yet. It won’t stop your attacker, but will most likely scare him off. I’ve included one model in the reviews below. Gun cane is a lethal weapon. You’ll need a carry permit. It’ll get confiscated at a security checkpoint if you have to pass through one. This makes the gun cane unreliable for many situations (like the train station stabbings I mentioned earlier). Sword Cane has the same problem. You won’t get past security with it. The sword will be thin and frail (since it needs to fit inside the cane). You’re better off bringing a knife. 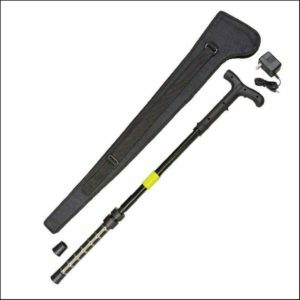 Tactical combat self defense canes is what we’ll be looking at. The real “hidden in plain sight” weapons that you can carry anywhere. Which ones are best – and how to choose one. 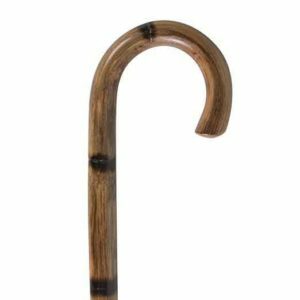 A good self defense cane will have a wide hook handle. Canes with straight handles are not as versatile. Basic trapping maneuvers – hooking your opponent’s leg or throat – are impossible to do with a straight cane. Therapeutic metal canes – the ones with a slight hook that you can find in your average pharmacy – have the same problem. They’re great for walking… but not designed for self defense. The hook is too small to be useful – also making it easy to knock the cane out of your hand. A normal hooked cane is what you’ll want to use for self defense. But the hook also needs to be big – shaped like a half-circle. Having a large hook is crucial for trapping the limbs of your opponents. Having a large hook area will allow you to twist the cane around fast. For situations where someone has grabbed your hand and you need escape their grasp. Note: The hook of your typical wooden cane from a pharmacy curves inward – it’s too small to trap limbs. 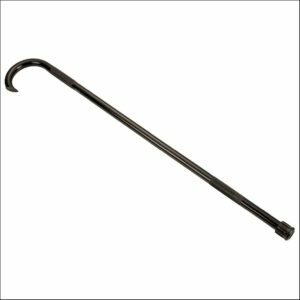 The wide hook is the only feature that your self defense cane absolutely needs to have. Everything else you can negotiate. The material of the cane is important when it comes to self defense. Wooden canes are lighter than metal canes, but they can break during a fight (with a well-aimed strike to the middle). Having said that, a wooden cane will be fine for most people. It won’t raise any eyebrows no matter where you go (and no matter how sharp the tip). But wouldn’t you want your cane to be unbreakable? Metal canes (usually made of airplane-grade aluminum) are tougher than wooden canes. They’re unbreakable in all but extreme situations. At the cost of a slightly heavier weight, you’re getting a cane that will last you a lifetime. For survival situations – metal cane is the way to go. Besides from being a self defense tool, it will also function as an improvised crowbar. I’d rather have you strike one power shot at your opponent than sit there beating him down. Personally – I like to know that I’m holding something that won’t break – no matter what I do with it. A self defense cane will have notched gripping surfaces on the shaft (top and bottom). They’re there to help you hold the cane during a fight. Wooden self defense canes may also have notchings on the entire shaft. A notched shaft is more likely to break skin and cause pain – especially in areas with bones close to the skin (such as jaw, forearm, shin etc.). The tip of your cane (the one at the end of the hook) is a concentrated point of pressure. A basic move in cane self defense is to stab the hand of the attacker that is holding you from behind with the tip of the cane to break free. Softer tips are found on practice canes, but for self defense it’s better to go for something sharper. The cane is made from aircraft aluminum and is black powder coated. The tip on it is aggressive – but not too aggressive. It’s enough to do serious damage, but won’t stand out in the crowd. 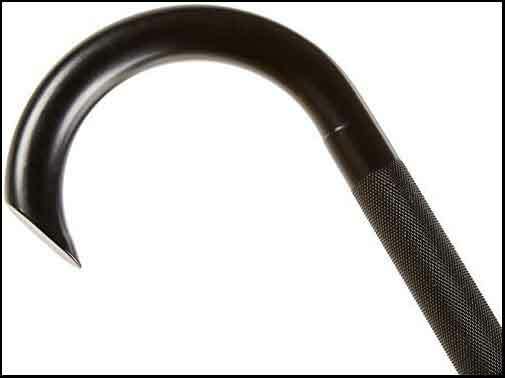 The hook is very wide – good for neck and leg hooking – just as a fighting cane should have. Aggressive holding grip – in a fighting situation you’ll want something to grab on to. You can store small items in the hollowed out shaft – cash, spare keys, paracord, small knife – for emergency situations. Just keep in mind that the items will show up on scanners in courthouses and airports. The only drawback: At 2.15 pounds, the Ka-Bar is heavy. 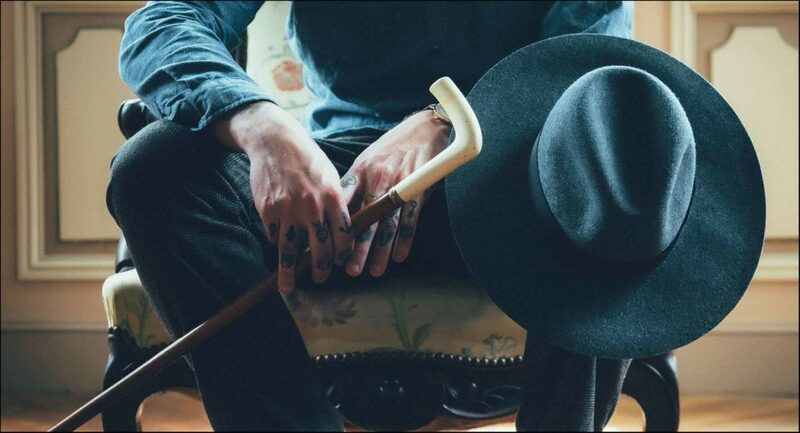 The cane itself is hollow, but the walls are thick. It’s still fast, but you’ll need some forearm strength to maneuver it around. But hey – if you are into cane self defense… you’ll need that forearm strength anyway. I’d see it as a training opportunity. Plus, once you get used to the Ka-Bar, any wooden cane will feel like a feather. I can’t stress the looks enough. Especially when you compare this cane to other metal/composite canes – the Cold Steel or Ultimate Cutlery – it just looks really, really good. And looks are important – you don’t want to walk around town looking like a psychopath killer out of a zombie movie. Final note – metal canes are better for bigger people. a wooden cane might bend under you if you’re on the heavy side. Essential Medical is the budget option self defense cane. If you’re on a tight budget – this is the cane for you. The hook is wide enough for hooking limbs. Which is all that you really need out of a self defense cane. You could use this one as a training cane as well. First off – this is not a fighting cane. It doesn’t have a hook (crucial for cane fighting techniques) and is less sturdy overall (not designed for hard impact). This is a taser cane. And that might be good or bad. For a fighting cane to be useful, you need to have the proper training. Training takes time, practice, and effort. So, at the beginning of your training, you won’t be able to defend yourself for a while. This is a problem. With a press of a button, you can simply shock your attacker. The shocks are strong and penetrate clothing. Most importantly – the shocks are loud. There’s a good chance that the attacker will give up and run. I know I would when hearing that thing. As you could see from the video, that guy got a real painful shock from the cane. The sound of electricity alone will scare off most attackers. Would the pain from the shock be enough to stop the attacker? While better than nothing, a shock from the Zap cane won’t protect you from the attacker – you’ll still have to fight him in hand-to-hand combat after he recovers from the shock. In short, the Zap cane is not good a alternative/replacement for your martial arts cane. It won’t protect you from other people. But it GREAT at protecting you from animals – like stray dogs, for example. Imagine you’re walking your dog and another dog attacks. One zap with the cane will send any animal fleeing for its life. The cane really shines when used against aggressive animals. You can recharge it from a wall socket. A single charge shocks up to 500 times. That’s 500 animals fended off. TRS solid oak cane is a more premium cane for self defense. This thing costs a bit more – but you’re getting a handmade oak cane with a slightly sharpened tip. It costs almost as much as the Ka-bar. So I would go for the Ka-bar instead. 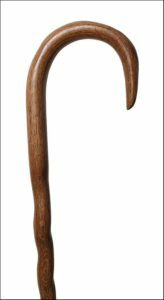 But if you want a solid wooden self defense cane, you won’t go wrong with TRS. For more premium wooden self defense canes, check the canemasters shop. An alternative to Ka-bar self defense cane. Personally – I don’t like the looks of the United Cutlery cane. It looks like a crowbar out of a zombie movie. Not something that I’d want to be seen carrying in public. You’ll look suspicious wherever you go. If you do want to look dangerous – go ahead and get it. Note: the cane is not made out of polypropylene as stated in the video. This is what – a walking stick? The Cold Steel doesn’t even have a hook. You can only hit things with this cane. Essentially – it’s a heavy metal rod. If you’re looking for a real self defense cane, I recommend you look past this one. How to use a self defense cane? Do I have to register my self defense cane as a weapon? Normal canes are considered medical devices for the elderly – no registration necessary. 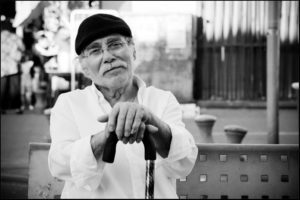 If your cane has an inbuilt shocker, gun, or a blade – you’ll need to check with your local law authorities. Depending on your state, you may need to register it as a weapon. How To Make A Self Defense Cane? 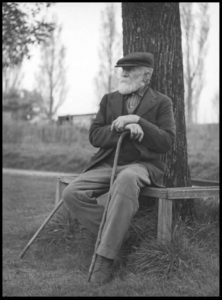 Offgridweb has a great guide on how to make your own bushcraft cane to use it as a walking stick or a self defense tool. Can I Travel With My Self Defense Cane? Metal canes are usually O.K., but there are some airports that require proof of disability if you want to carry a metal cane. So make sure you double-check the requirements of your airport before traveling with a metal cane. 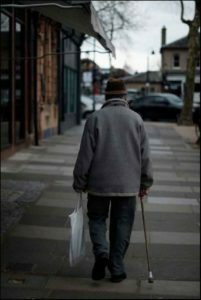 I am a male aged 66 years old and I carry my K-Bar walking cane every where I go, I also train with it every day, I use and old car rubber tyre . Also to make it a little lighter I have filed notches the whole way up the cane, this helps with grip. Yes I agree with you the best cane ever will last me the rest of my life time.